New to TINYpulse? First and foremost, welcome! TINYpulse helps you capture employee feedback at all stages of the lifecycle from hire through retire. We help you ask the right employees the right pulse questions so you can stay on top of how all employees are feeling. 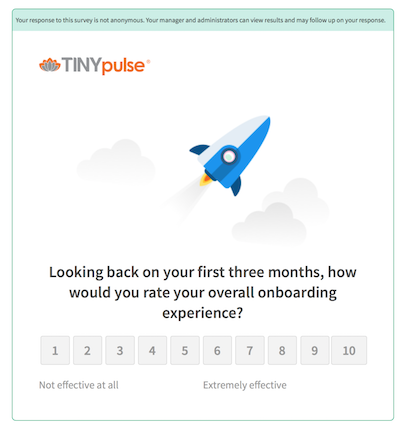 TINYpulse offers two types of pulse surveys; anonymous surveys to keep employees engaged, and non-anonymous surveys for new hires to get targeted feedback about the onboarding experience and help set them up for long term success. Read on to learn more about TINYpulse surveys and how to use both offerings to get the most out of your subscription. (i) This article is intended for administrators of TINYpulse. Engage pulses are ongoing, 100% anonymous, and designed to give employees a safe place to voice their workplace opinions and suggestions. Pulses are sent out on a cadence of your choice; either every week, every other week, or every four weeks. Questions give admins a range of insights on categories such as culture, transparency and communication, recognition, talent retention and attraction, and more. If you could change one thing about our current processes what would it be? Were you recognized the last time you went the extra mile at work? 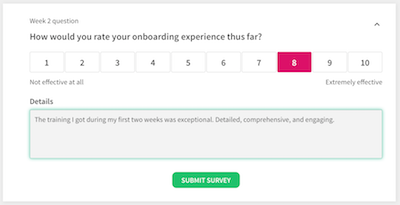 TINYpulse Onboard sends new hires four targeted pulse surveys to collect feedback about their onboarding experience. Pulses are sent at key points to find out how employees are integrating into their role and to uncover any underlying issues in the onboarding process that can be improved for future new hires. New employees have a unique perspective from the rest of the workforce since they see things with fresh eyes. The Engage pulses are great for keeping existing employees engaged in their roles, but may not be relevant for new hires. Imagine being asked a question like "Do you receive mentorship in your role?" or "How happy are you at work?" in your first week at a new company. Apart from having a negative impact to your overall results since the new hire perspective may skew data, they may not even respond at all since the question probably doesn't apply to them. That's why Onboard asks new hires the right questions, at the right time. New employees are able to give constructive insights right from their first week, while getting into the habit of giving feedback through TINYpulse as they ramp up in their role. One key difference between the two surveys is that Onboard questions are not anonymous. New employees submit feedback through Onboard with their name associate with their response. Feedback is non-anonymous because we want to give leaders actionable feedback to help set new hires up for success in the most effective way possible. Managers and administrators can immediately view employee feedback and work with them directly to resolve any issues and provide support in real time. Pulse surveys intended for new hires within the first 90 days of employment. Fixed question cadence; the Wednesday after the employee's first, second, fourth, and twelfth weeks of employment. Cheers and anonymous suggestions submitted separately from the survey in the LIVEpulse employee module. 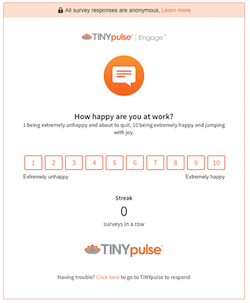 Pulse surveys designed to keep tenured employees happy and engaged in their work. Custom questions and a loaded question bank for administrators. Semi-flexible survey cadence (once a week, once every two weeks, or once every four weeks on Wednesdays). Cheers and anonymous suggestions submitted with the Engage survey or anytime in the LIVEpulse employee module or with the mobile app.